From Spam: A Shadow History of the Internet by Finn Brunton pg 197. The thesis of this impressive book is that what we call ‘spam’ is fundamentally a deliberate and disenguous violation of salience: it’s because of the vast array of new instances of salience being opened up, in which we search for and have a reasonable expectation of locating relevant material, each one providing an opportunity for us to attend to something in this new digitalised archive. Spam persists and diversifies because we are living through a major, complex transition in the constitution and management of our own attention, a transition moving faster than our governance, our metaphors, and our software can keep up with. Spammers—the disbarred lawyers, impoverished con artists, would-be pornographers, credit card thieves, and malware coders—are the avant-garde, the wildcatting exploiters of this transition. They find domains where salience is being generated, whether in a comment thread, a search engine result, a social media platform, or your email inbox, and move to commandeer it. They are the crudest and most abject form of this capture, from students pranking each other with the words of a Monty Python sketch to global botnets producing more email than everyone else on earth, every single day. In their crude way, they show the rest of the online population the network’s new capabilities, the new forms of attention and community experience, which we have not yet fully understood. Is the murky world of internet marketing making me paranoid? Is the murky world of internet marketing making me paranoid? Or does anyone else share my scepticism about this e-mail? I’ve edited out the name in case I’m wrong but the enclosed web address & twitter feed has no content on it. My name is [x], an aspiring writer. I’ve been working on sharpening my skills for about 3 years now and having my work published online has been most helpful. I would like to inquire if you accept contributions on markcarrigan.net from guest authors? It would be an excellent opportunity to contribute an interesting piece that will bring value to both your site and your readers. Do check out some of my published works on Techie Doodlers and my personal blog. Any feedback about my writing would be awesome! Please let me know if you are interested. I am more than happy to send a couple of topic pitches or start writing my piece right away. Thanks and here’s hoping I hear back from you soon! Receive Calvary greetings from Miss Ashley Gaskin from Missionary Church of Montana. We have learned much more about the work you do through online and we are so much interested with the good work that you are carrying on and we therefore wish to donate some small funding for your project to goes to your project where funds is needed most . Can you please send more information about how to send online donations through a payment gateway facility and advice how long it take before you get the funds donated online? The Bible is the Word of God; supernatural in origin, eternal in duration, inexpressible in valor, infinite in scope, regenerative in power, infallible in authority, universal in interest, personal in application and inspired in totality! I was surfing for quality websites which emphasizes the importance of “Tutor” and found “http://sociologicalimagination.org“. I’m writing up this mail just to get a hold of you for appreciating your good work on maintaining an informative & attractive website on the topic of “Tutor”. Actually I have just put together a cool infographic on the key points of “Tutor” techniques and to add more spices we also included the latest trends evolving around this topic. I thought someone like you who is already writing a lot about this topic will get some insights out of it. If you can be so generic and share it in your website, it may bring more traffic and add real visitors to your site. Revert back if you want to check it out. Is this algorithmic or solely idiotic? 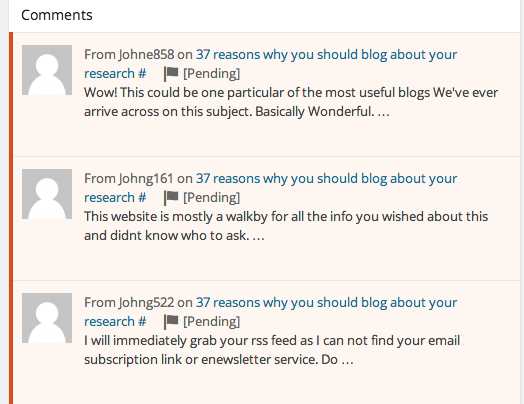 Has anyone else’s wordpress spam filter stopped working? Is anyone else weirdly fascinated by this sort of spam? Hello my dear , How are you doing ? . My name is Miss lilian . It is my pleasure to see your profile here and it interests me to be your friend . I want us to be friends if you do not mind . Your status , country , color , age , language , tribe , religion , etc , will not prevent us to be friends as i seek for your friendship from my pure heart . I am new to this site and i may be out of it any time from now . I may not have the chance and time to log in here again to reply you here , for that reason i will be pleased if you will get back to me on (lilianuseh@yahoo.com) and i will reply you as soon as possible . I will tell you more about myself and send you my pictures if you accept my friendship . Have a lovely day . Cheers . And to think we never would have met if not for Facebook!